Below are common attributes associated to Variegated Privet. Become a care taker for Variegated Privet! Below are member comments regarding how to plant Variegated Privet. No comments have been posted regarding how to plant Variegated Privet. Be the first! Do you know how to plant Variegated Privet? Below are member comments regarding how to prune Variegated Privet. No comments have been posted regarding how to prune Variegated Privet. Be the first! Do you know how to prune Variegated Privet? Below are member comments regarding how to fertilize Variegated Privet. No comments have been posted regarding how to fertilize Variegated Privet. Be the first! Do you know how to fertlize and water Variegated Privet? Below are member comments regarding how to deal with Variegated Privet's pests and problems. No comments have been posted regarding how to deal with Variegated Privet's pests and problems. Be the first! Do you know how to deal with pests and problems with Variegated Privet? Get Variegated Privet fresh and large directly from the grower to your garden! Buy Variegated Privet online from the nursery wholesalers and save BIG! 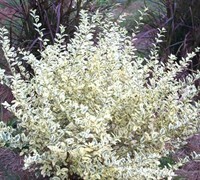 Plant Variegated Privet in a location that provides well-drained soil and full, all-day sun to part shade. This is a hardy, exceptionally fast growing shrub that is useful as a mid-size natural or formal hedge or background. Can also be useful as a tree-form specimen or focal point. To plant Variegated Privet, dig a hole no deeper than the root ball and two to three times the width of the root ball and fill it with water. If the hole drains within a few hours, you have good drainage. If the water is still standing 12 hours later, improve the drainage in your bed, perhaps by establishing a raised bed. Turn and break up the soil removed from the planting hole. If the native soil is dense, compacted or heavy clay mix in a good organic compost or soil amendment at a 50/50 ratio with the soil removed from the hole. Remove your plant from its container and carefully but firmly loosen the root ball. Set the plant into the hole you've prepared, making sure the top of the root ball is slightly above the soil level. Pull your backfill soil mixture around the root ball in the hole, tamping as you go to remove air pockets. Then water thoroughly and cover with a one to two-inch layer of mulch. Variegated privet does not require pruning however responds well to it. Shear as often as you like to shape or create a formal hedge. It can also be limbed up into a quite attractive small tree. Feed Variegated privet in spring and again in late summer with a well-balanced shrub & tree type fertilizer. You won't have any insect, pest or disease problems with variegated privet. This plant is not a good choice for foundation plantings as it grows much too fast and large. It's a low maintenance plant that won't require much pruning if given room to grow to it's full size, such as in a screen planting.